Relentless hikes in the cost of buying a home have resulted in house prices rising by more than 7pc in the past year, new research revealed. 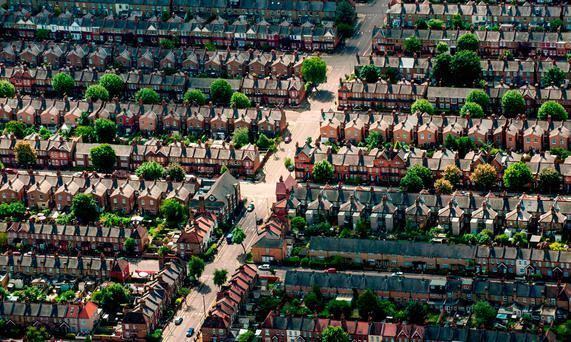 The new figures show house prices have risen by 50pc from their lowest point in 2013. The average cost of a house in Ireland soared by €82,500 in the past five years. In Dublin, the rise in house prices in the five-year period has been more dramatic - up €145,000 since 2013. In the past year, the biggest price increases in the capital were in the South Circular Road area, where prices have shot up by a third. As demand for houses continues to grow, the surge in national house prices in recent years "indicates how inadequate the housing supply is," said Ronan Lyons, economist at Trinity College, Dublin. Mr Lyons is the author of the latest House Price Report, released today by Ireland's leading property website, Daft.ie. Nationwide, the average price paid for a house is now €247,000, some 7.3pc higher than a year ago, he said. 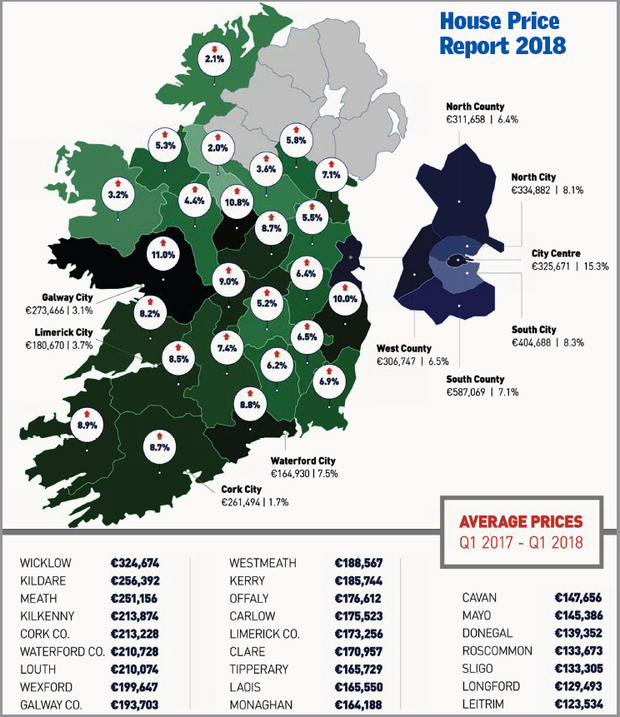 But there have also been a number of towns in Ireland were prices have fallen by almost 10pc in the past year. In the first three months of this year, house prices rose nationally by 2.5pc. In Dublin, prices rose by 2.3pc in the first quarter of the year. In Cork the increase was only a marginal 0.3pc and in Galway the rise was even less at 0.1pc. But in the past five years, Cork prices are up 59pc and Galway prices rose by 70pc. In Limerick and Waterford cities, prices rose by 2.1pc and 2.4pc respectively in the first three months of the year. Outside the main cities, prices rose by 3pc in the same period, with the largest increases in Munster, outside the cities. Some of the pockets where prices actually fell in the past year include the Beara Peninsula, Lifford and Raphoe in Co Donegal, Swinford in Co Mayo, and Tara in Co Meath. The number of properties available to buy on the market nationwide continues to fall. There were just over 20,000 properties on the market in March. But there has been a significant increase in Dublin listings - up from 2,700 a year ago to 3,500 now, largely offset by a fall in availability elsewhere. The number of properties on the market outside Dublin is now at 16,800, down 1,000 on a year ago and the lowest on record, for a series starting in January 2007. "The picture of the housing market in Ireland currently remains one of strong demand and very tight supply pushing up prices," said Mr Lyons. "There are some elements for cautious optimism, including an increase in transaction volumes countrywide and in stock on the market in Dublin. "Nonetheless, during a five-year period when consumer prices did not change, housing prices rose by 50pc. This is an indication of how inadequate housing supply is," he said. Martin Clancy from Daft.ie said: "Interest and activity among property hunters remains very high. At the moment, we are seeing on average of over 1,000 property searches taking place every minute on Daft.ie". ■ Waterford city: €164,930 - up 7.5pc. Outside Dublin, there are only 16,800 homes on the market - the lowest recorded since Daft.ie started recording the total number of properties on the market, back in January 2007. The overall pattern is clear: given there is strong demand for housing countrywide, the lack of supply - especially of newly built homes - is driving prices up. But not everywhere is experiencing the same growth in housing demand. Dublin is seeing an increase in the numbers of houses on the market - especially as the new homes segment shows on-going signs of recovery. But nonetheless, the increase in prices there in the last year, 8.4pc, was greater than elsewhere in the country (6.5pc). Daft.ie states that each area of the country is really its own local market, with factors - such as proximity to jobs or to amenities like schools or transport - that determine whether demand is stronger or weaker than the national average. The Daft.ie Report breaks down the country into almost 400 "micro-markets", 117 of them in Dublin with a further 39 in the other four cities and the remaining 233 spread across the country - 89 in Leinster, 76 in Munster and 68 in Connacht-Ulster. For each of these micro-markets, it is possible to trace the path of the average sale price of housing. These averages are independent of changes in the mix of properties listed for sale, so differences over time are not being driven by more four-beds or fewer apartments on the market.